Josh Tranks Fantastic Four isn't the worst superhero movie ever made. Let's be clear about that. Joel Schumacher's Batman & Robin still is the worst superhero ever made. Fantastic Four is not. But that's also, partly, because it's not a superhero movie at all. I know that the film is an attempt at rebooting the failed franchise that delivered us two mediocre-to-bad movies in the noughties. They were simple, clear, fan-serving superhero movies. They told a story about some scientists going into space, getting into an accident and coming out of it on the other end with super powers. It's a very simple, very basic concept. It's not a bad concept. It is, however, an old one, and it has gotten stale. It was already boring a decade ago. So it's a good thing that this version of Fantastic Four doesn't try to be the same type of movie. In fact, I would go so far as to say that Trank c.s. have tried not to make it about superheroes, but about scientists tinkering with stuff they're not supposed to tinker with. Because most of the movie is spent looking at Reed Richards story. From him zapping little toy cars into another dimension to him going into the dimension himself, and exploring what's on the other end. It's a primal human desire: to explore, to find the boundaries and cross them, and keep trying where others have failed. I'm not going to include a lot of spoilers in this, but I will mention some story elements you might want to check out for yourself before you read on. The movie starts with Reed, a kid in school, proclaiming that he's working on a teleporting device. He's being ridiculed, but it doesn't really bother him. He just goes on, and meets a classmate, Ben, when he's trying to get a machine part for his device at Ben's father's junk yard. It starts a friendship between the two, in which Ben helps Reed further his science, until Reed is discovered by a scientist, who employs other young promising scientists to try and nurture their scientific drive, who has been working on the same concept. One thing leads to another and after some more explaining, and even a montage, Reed, Ben and two others find themselves in a very dangerous situation on another planet. Cue super powers. But it's not really the point of the movie to get the main characters their powers. The point is to get them to achieve their goal, in sending stuff to another place and retrieving it. The point is that they get stupid, possibly because they're drunk, and visit the other end of their teleporting gateway themselves. Things go wrong on the other side, because they're young, lack the wisdom to have enough caution, and travel to an unknown place unsupervised. There's a lesson here; it's okay to explore, to find new worlds, to create new technology, but know that you're getting into some seriously dangerous stuff. Know that unexpected things may happen. And what I think about Fantastic Four is that it, initially, tries to build something around this message. Maybe tries to find out what the message should be. I think the assignment to create a new movie about this classic superhero group has led Josh Trank, Simon Kinberg and Jeremy Slater, who are credited as having written the screenplay together, to try and find a new and more interesting way to approach this. It's more human, thematically richer, less about super powers and being a hero in front of a cheering crowd. In fact, there is no cheering crowd here, and I'm not talking about the audience: there are some heroics, there's some world saving, but in the end, that's not the point of the movie. 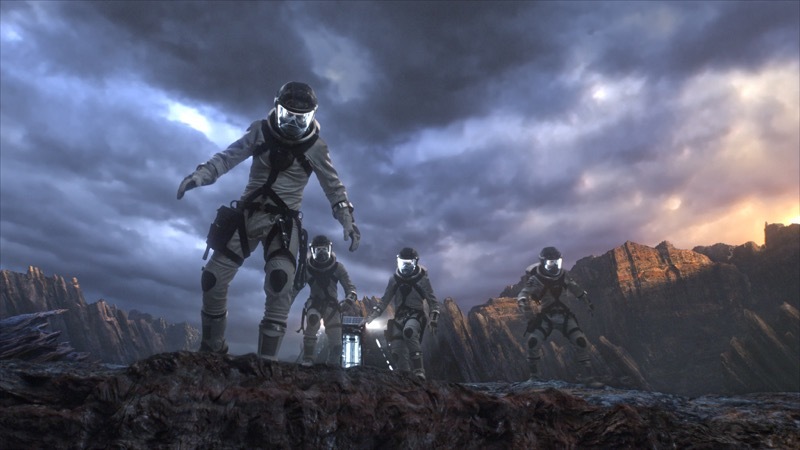 In fact, the part of the movie that is about the group working together, using their powers, fighting the bad guy, is by far the most uninteresting part of Fantastic Four. It's where a potentially compelling story, a cautionary tale about tinkering with science, completely falls apart because it suddenly remembers it was supposed to be about a bunch of Marvel characters. Okay, it's not that the movie was a piece of brilliance up until that point. It was mediocre. It looked at some interesting things in terms of characters, their backgrounds and their motivations, but it was too involved with getting to the superhero part to notice there was a nice little story in there. And that's why a very decent cast didn't really have anything interesting to do, because they were dragged along to what in other iterations of this story would have been the inciting incident in the first act. Fantastic Four should have been a longer movie: it should have taken more time to try and strengthen the story about Reed and the people he meets on the way to his achievement. It could have gone deeper in terms of character. It shouldn't have bothered with a big battle at the end, instead focusing on the human element. Because this movie shows that it knows about the human element; it's acknowledged, examined ever so slightly until, again, someone remembered there was supposed to be some super heroics somewhere. So, in the end, what is being sold to the audience as a superhero movie really isn't. It's a movie that tries to be something else but acts like it's not allowed to. It's a thing with enough interesting elements to create something brilliant out of, but it just didn't work out. I liked that it tried to be something else, and I'm sad it didn't work out. Fantastic Four is not a horrible mess, but it is a failure, because it's neither what it's supposed to be, nor what it could be. But it's still interesting enough to have a look and see for yourself the stuff that's in there, that could have become that interesting, new take on a team of Marvel characters. What is the fourth letter in Rotterdam?